James Carrique Ponsonby, vol.3 of [History of the Irish Parliament]. 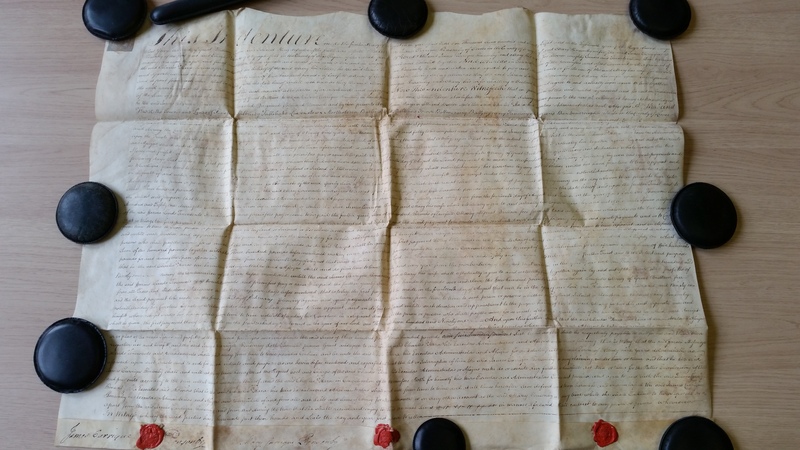 Deed, Ponsonby to O'Hara, dated 3 May 1766, registered 12 May 1766, [LR] vol. 251 p.79 no. 160211 (NOT p.77). 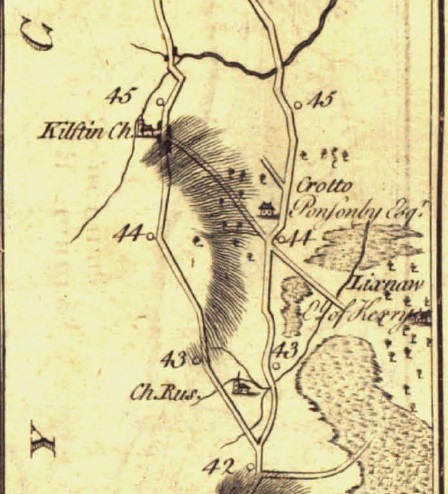 This is about extensive Ponsonby lands in Co.Kerry and Co.Limerick. 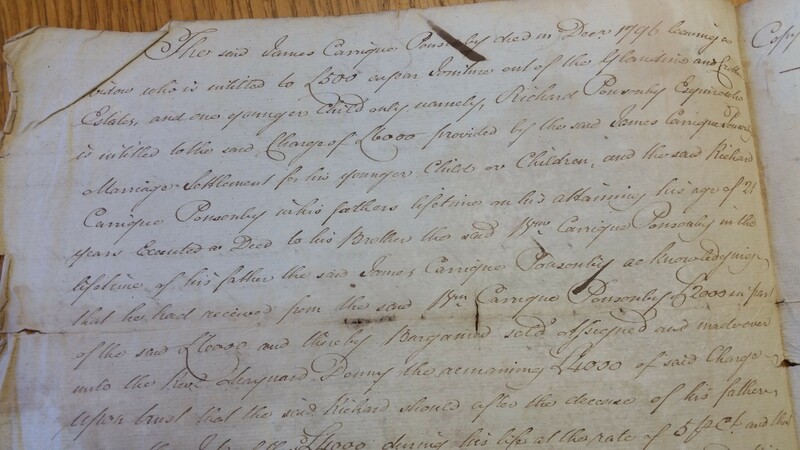 Deed, O'Hara to Ponsonby, dated 2 and 3 May 1766, registered 12 May 1766, [LR] vol. 251 p.81 no. 160212. This is about extensive O'Hara lands in Co.Sligo. MS 36,488 in [O'Hara Papers]. MS 36488 /7. Lease for 99 years, or until James Carrique Ponsonby and his wife, Mary (nee O'Hara) agreed to live together again, of lands in the County of Limerick from James Carrique Ponsonby to Charles O'Hara (the younger) for £300 per year. Separation agreement between James and Mary Carrique Ponsonby, under which he is to pay her £500 per year, while they lived apart. 14 August 1778. See photo. MS 36488 /8. 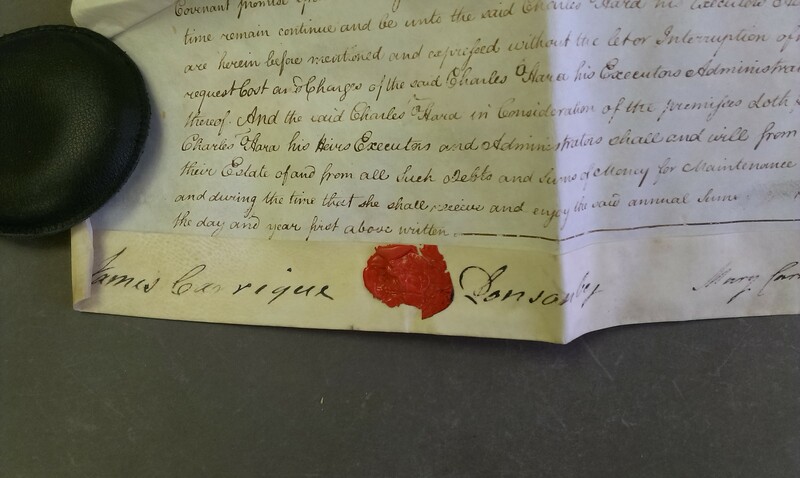 Deed appointing receiver for the estate of James Carrique Ponsonby, estranged husband of Mary O'Hara. 4 Oct 1783. Lands in Co.Kerry. Rowland Blennerhassett is party to it. Refers to the Act of Parliament, 1781-82. Deed, Shiel to Ponsonby, dated 30 June 1769, registered 1 July 1769, [LR] vol.272 p.562 no.176498 (NOT p.527). Deed, Ponsonby to O'Hara, dated 7 Nov 1770, registered 10 Nov 1770, [LR] 283 167 183578. 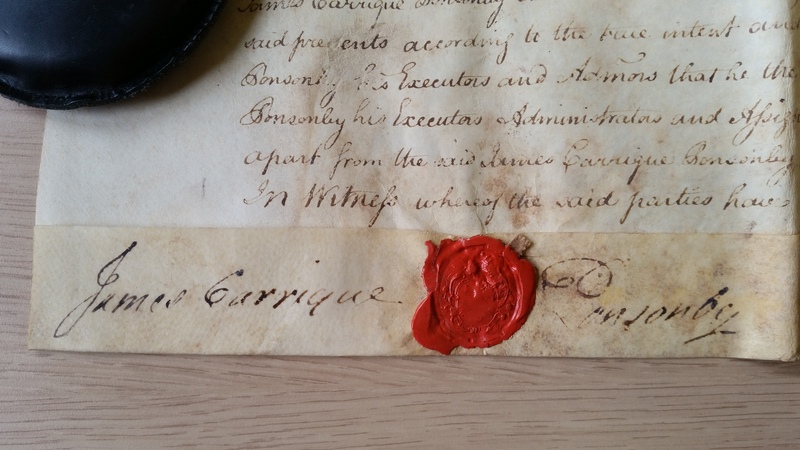 Deed of 1777-85 references James Carrique Ponsonby. [LR] book 321 p.399 no.217080. 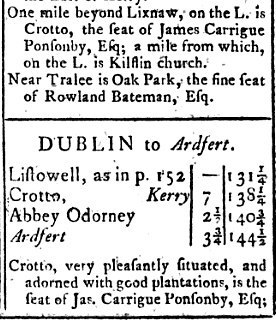 Deed, 3 Mar 1781, between James Carrique Ponsonby, of Crotto, Co.Kerry, and Thomas Rice of Dublin. Deed wit by Henry Blennerhassett. Quoted in [Ponsonby, 1929]. Deed of 16 Dec 1789, registered	11 Dec 1790, between James Carrique Ponsonby and his son William, and Henry Blennerhassett of Dublin. [LR] book 430 p.58 no.278901. Private Irish statutes before the Act of Union. Act of Parliament, 1781-82 (21 and 22 George III) chapter 5P. "For vesting in trustees the settled estate of James Carrique Ponsonby, esquire in co. 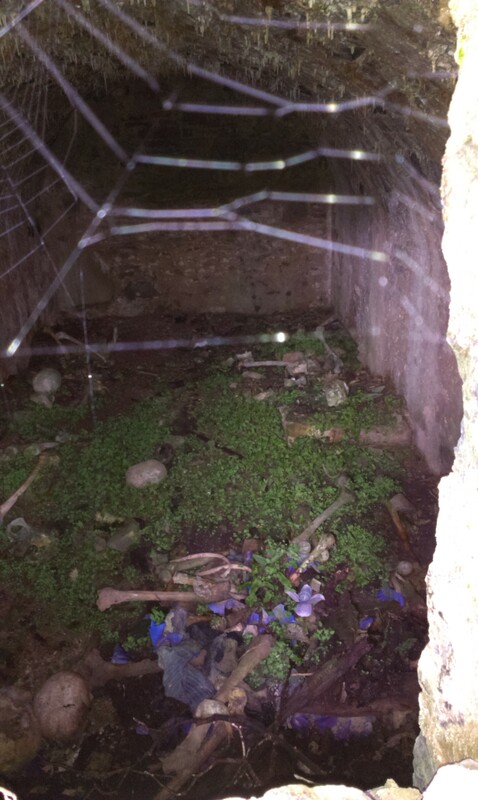 Limerick, and certain parts of his unsettled estate in co. Kerry". Freemans Journal, 10 Dec 1796. 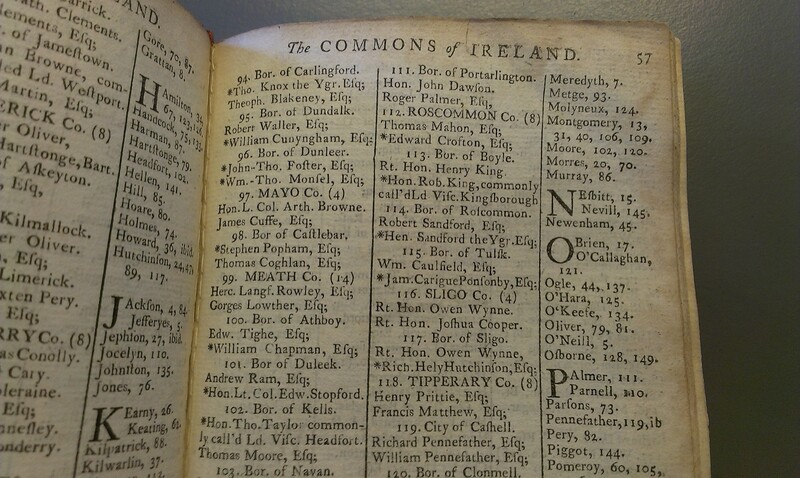 [History of the Irish Parliament] cites a source for James' entry: "WHM (1797) p.96". Abbreviation "WHM" is unidentified. 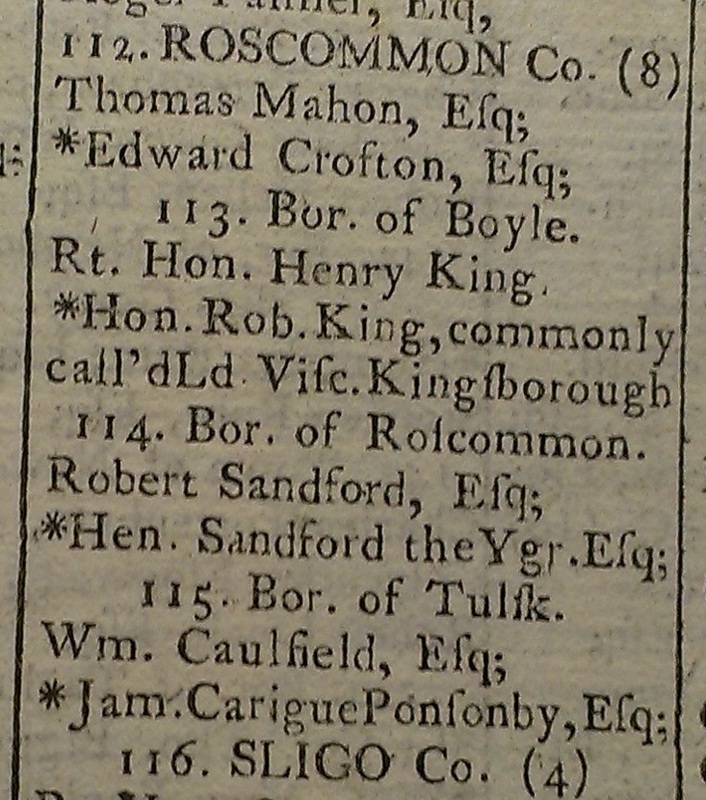 James Carrique Ponsonby, MP for Tulsk, listed in [Dublin Almanack, 1777]. He was educ TCD. Entered 1754, age 16. See entry in [TCD Alumni]. He (with his father) changed his name to Carrique Ponsonby in 1762. He did NOT mar 1stly to Cookson. This is confusion with his brother-in-law Charles O'Hara (the younger). 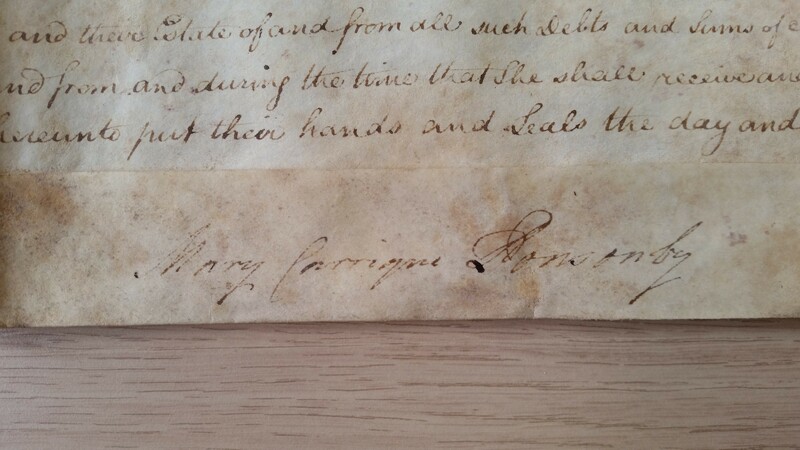 He mar [Marriage settlement, May 1766] to Mary O'Hara [born est c.1742, descendant of Henry VII]. James in [Deed, 1769] takes possession of a property in Clare St, Dublin (see map). Deed witnessed by "Rowland Blennerhassett of Dublin" (unidentified). In [Deed, 1770] he transfers the Clare St, Dublin, property to his father-in-law Charles O'Hara (the elder). Mary's father died 1776 (her mother had died in 1759). James and Mary separated in 1778. [Ms 36488/7] has deed dated 14 Aug 1778, implementing their separation agreement. It says that they "for diverse weighty causes and considerations them thereunto moving are come to a full and final resolution to live separate and apart". James undertakes to pay her a very comfortable £500 per year while they lived apart (which would look like she was blameless in the separation, though see below). He transfers land in Co.Limerick to her brother Charles. The return from this will be her income. He may be "James Ponsonby" who is Lieutenant Colonel in the Kerry Legion as at 1779 [Fuller, 1919]. [Deed, 1829] says the original inheritance at the marriage settlement 1766 was £6,000 off lands in Co.Limerick, and the said lands were exchanged by Act of Parliament 1781-82 for other lands in Co.Kerry. High Sheriff of Co. Kerry 1781-82. 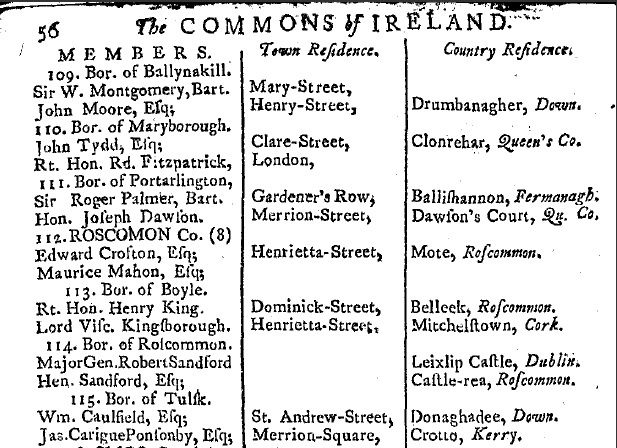 [History of the Irish Parliament] says: "In 1782 his wife was said to have run away with Lord Bellomont". But they were already separated at this time, so maybe she got to keep her £500 per year. "Lord Bellomont" is Charles Coote, 1st Earl of Bellomont. James was MP for Tralee 1783-90. See [Kerry MPs]. [History of the Irish Parliament] outlines his career in Parliament and says: "He voted solidly for the government". [Ms 36488/8] shows James and Mary as still separated in 1783. He died Dec 1796, age 58 yrs [Ms 20608]. 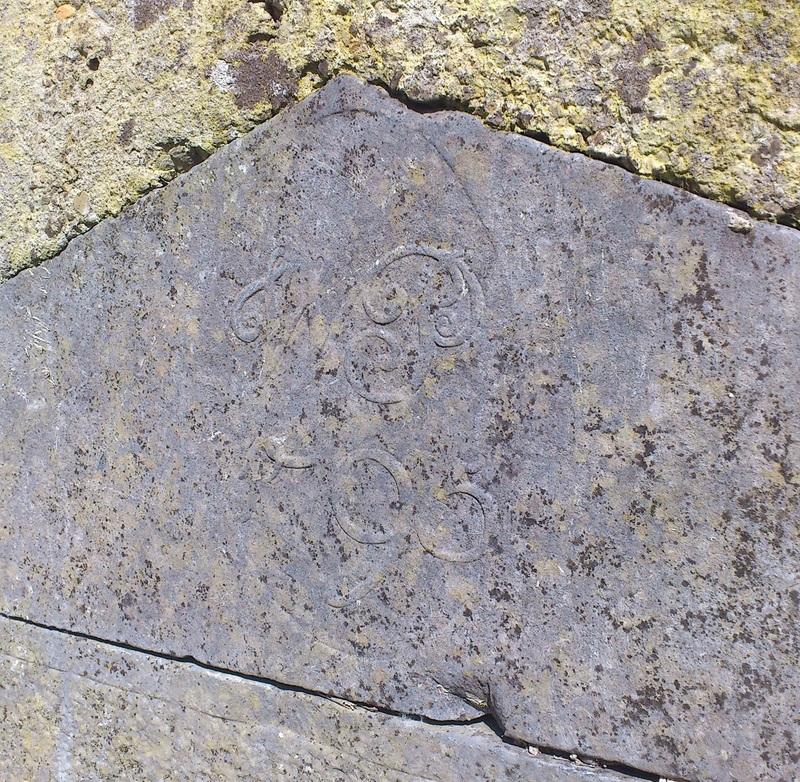 He would be bur in Ponsonby tomb in Kilflynn churchyard. Though tomb has inscription "W.P. 1795". Seems like his son erected it before father died. [Deed, 1829] said they had only two children. William Carrique Ponsonby, of Crotto, eldest son. [Ms 20608] says he reached age 21 in father's lifetime, i.e. born in 1770 to 1775. See p.1 and p.2. Crotto in [Taylor and Skinner, 1777]. 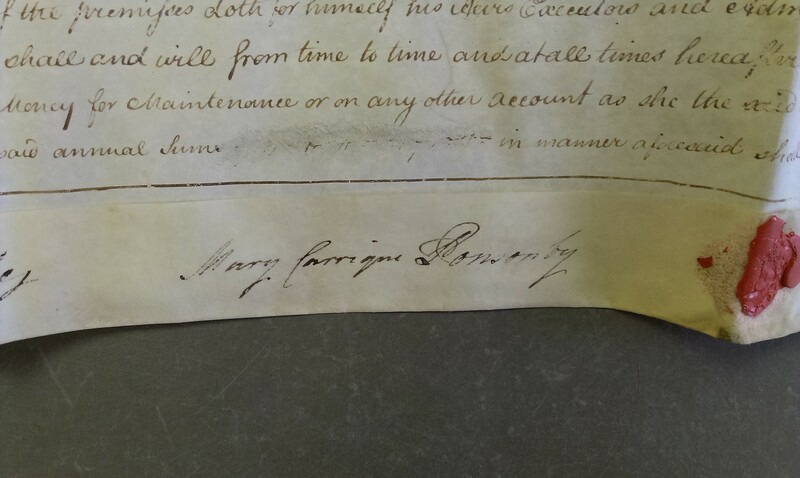 Signature of James Ponsonby on deed of separation, 1778, [Ms 36488/7]. See larger. See other signature. 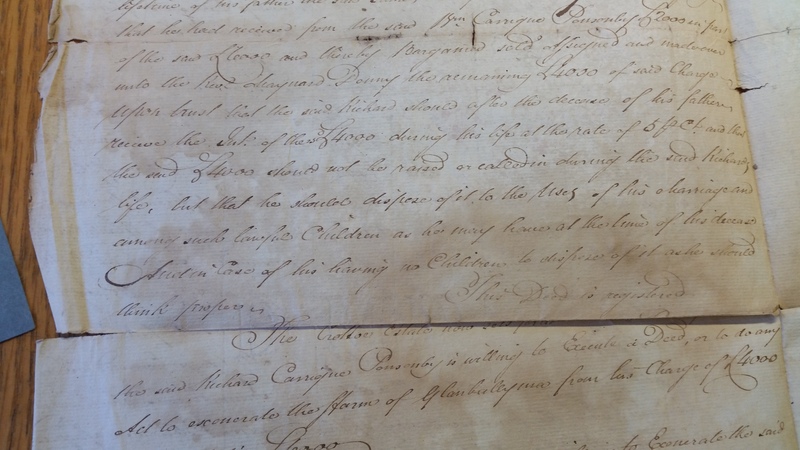 Signature of Mary O'Hara on deed of separation, 1778, [Ms 36488/7]. 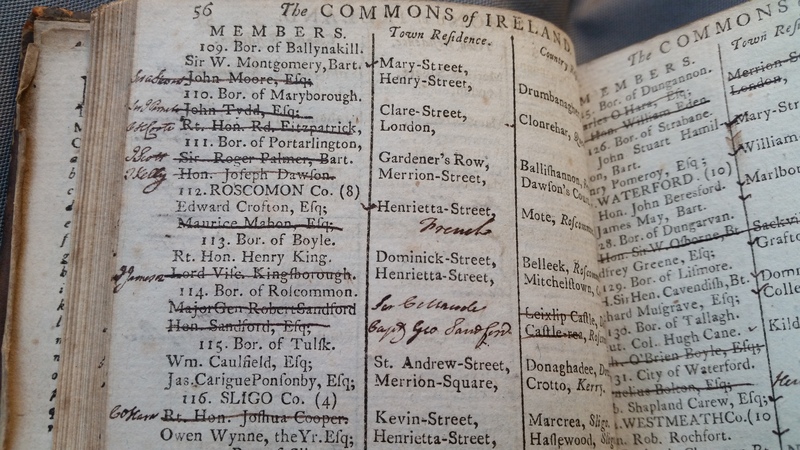 James Carrique Ponsonby, MP for Tulsk, listed in [Dublin directory, 1783]. When in Dublin at the Irish House of Commons his residence was in Merrion Square. Crotto in [The Post-chaise Companion, 1786, p.180]. [JMD] vol 9, no. 6, 1916, p.508, [NLI] Ir 9295 i 1. 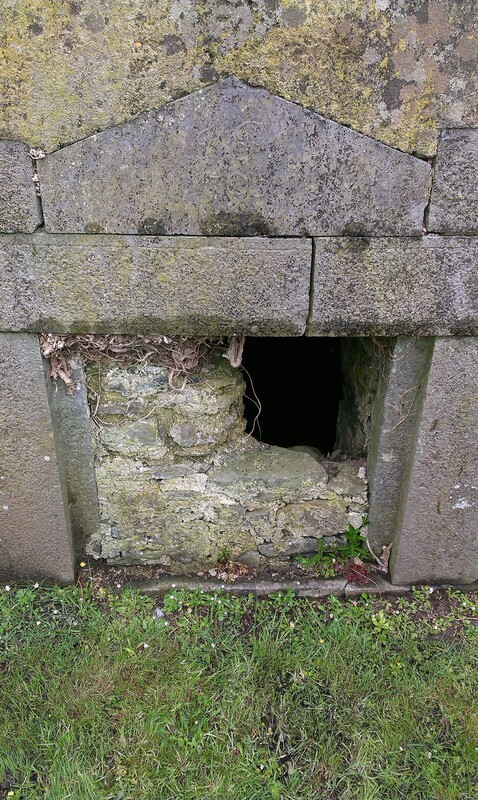 Vault of Ponsonby of Crotto, Kilflynn Church of Ireland graveyard, Kilflynn, Co.Kerry. See map and street view (note that the street view further down the road is out of synch). Inscription says "W.P. 1795". Does not say "J.P. 1795". [JMD] agrees it says "W.P. 1795". So apparently erected by James Ponsonby's son William Ponsonby in 1795 for his father, before his father died in 1796. 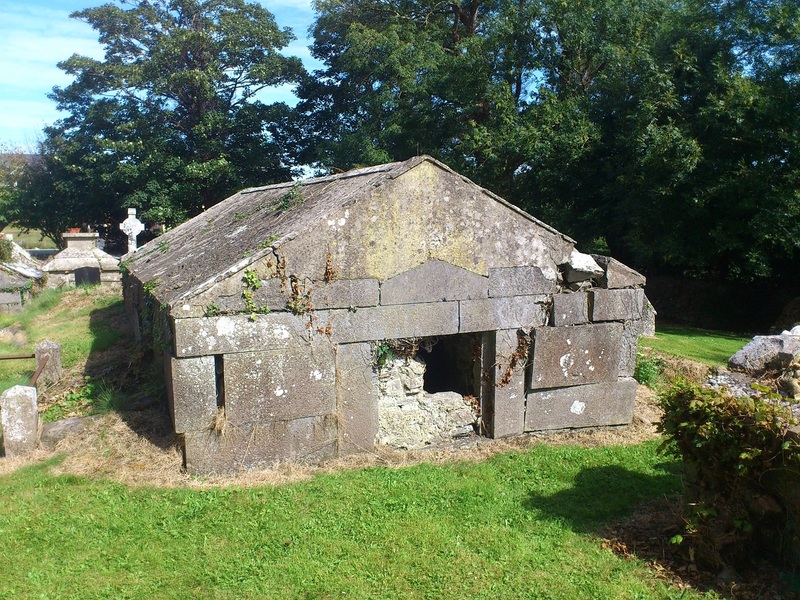 Ponsonby tomb in Kilflynn churchyard. Photo 2013. See larger and full size. Close-up of inscription on Ponsonby tomb. 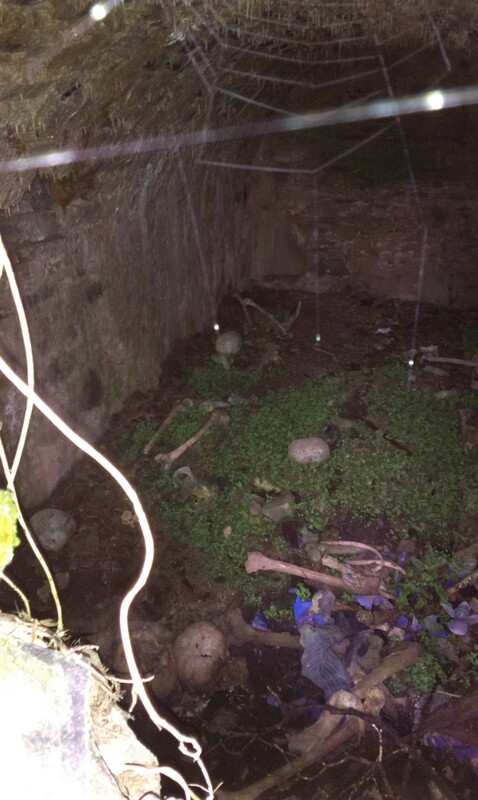 Bones are visible inside the vault through the hole. See 2016 photos of LHS inside and RHS inside.